The Civil War is over. Gabe wants to find his mama, but his mama got sold away. Young Gabe’s is a story of heartache and jubilation. He’s a child slave freed after the Civil War and he sets off to reunite himself with his mother who was sold before the war's end. “Come morning, the folks take to the road again, singing songs, telling stories and dream-talking of the lives they’re gonna live in freedom. And I follow, keeping my eyes open for my mama. Days pass into weeks and one gray evening as Mr. Dark laid down his coat, I see a woman with a yellow scarf ‘round her neck as bright as a star. I run up to grab her hand, saying, Mama?” Gabe's odyssey in search for his mother has an epic American quality, and Keith Shepherd’s illustrations—influenced deeply by the narrative work of Thomas Hart Benton—fervently portray the struggle in Gabe’s heroic quest. "Black folks still have so many stories to tell in our journey. When I first read Alexandria's manuscript I'm not ashamed to say I got choked up. I'm amazed there's never been anything done before that told such a heart wrenching segment of Reconstruction in America." To read more about how Walking Home to Rosie Lee came about, read the McBookwords interview with A. LaFaye and Keith D. Shepherd here. A. LaFaye hopes Walking Home to Rosie Lee will honor all those African American families who struggled to reunite at the end of the Civil War and will pay her respects to those who banded together through the long struggle for freedom. She is the author of the Scott O'Dell Award winning novel Worth and lives in Tennessee with her daughter Adia. "Set at the end of the Civil War, this account of a freed slave boy’s search for his mother is distinguished by a vivid narrative voice and page-turning suspense." Nikki Grimes, author of What is Goodbye? "What a treat! LaFaye has applied her considerable literary gifts to tell a post-Civil War story we rarely, if ever, hear, and has done so in a style as musical as any poem I've ever read. The voices truly sing. Brava!" A. LaFaye tells the story in an authentic southern voice, with an emotional arc that tugs at the heart. 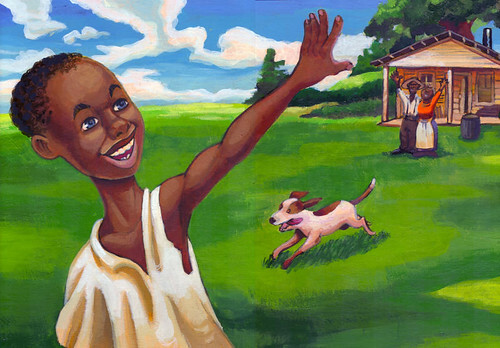 Newcomer Keith D. Shepherd’s rich acrylic paintings bring the story to life. A truly wonderful pairing of words and pictures. "Applying paint in thickly brushed impasto, Shepherd views Gabe’s world and encounters from a child’s-eye height but gives the barefoot, raggedly clad boy a look of hard-won maturity that points to past sorrows and underscores the depth of his determination. His distinct voice will draw readers into caring about his quest and sharing the tide of joy that accompanies his ultimate success: 'That night, I slept snuggled up tight with my mama, praying for all those boys like me searching for their mamas who be searching for them.' A deeply felt narrative…"
"One of the few titles to describe the cruel breakup of family under slavery from a small child’s viewpoint, this honest story also makes clear the anguish of the many loved ones who were lost and never found." "A read aloud that feels as if Gabe were sittin' on a porch telling how he found his mama. The story is strengthened by Shepherd's illustrations… Many classroom units will be well-served by this book. Parents and children will cry and cheer together." "Walking Home to Rosie Lee is written in a naturally cadenced, musical prose style that is both spiritual, Black, and authentic in its sound. Magnificent color illustrations display the vast array of faces and places encountered by young Gabe on his quest to find his mother. Walking Home to Rosie Lee is must-read literature for kids age 7 and up." "A well-told story related by Alexandria LaFaye and enhanced by the wonderful full-page illustrations of Keith D. Shepherd. Their talents are combined to celebrate the search of “strength, love, and determination” represented by Gabe’s quest." "Gabe is a relatable character and the story reads like he is talking to a friend. Creating a familiar relationship with the reader, it introduces them to the hardships of the time period, thus producing a perfect opportunity for children to be taught about the tough issues such as slavery, the Civil War, and inequality."